Mr. Clean makes a range of cleaning products designed to tackle any size job. 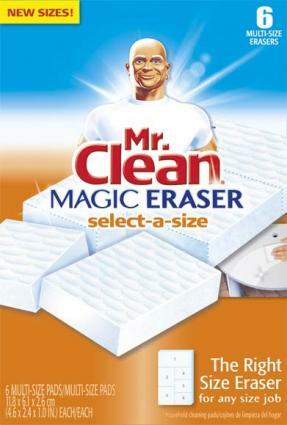 Mr. Clean recently released two new products that feature the unique Magic Eraser: the select-a-size Magic Eraser and Swiffer mop pad refills that feature a Magic Eraser scrubbing strip. I was recently sent both products to test, and I am pleased to report the results in this independent product review. Magic Eraser is a product that only requires water for use. This foam pad can be used for a range of cleaning jobs and on multiple surface areas. It is known for picking up particularly difficult stains. For those looking for a simple cleaning solution that doesn't require spraying chemicals, Magic Eraser products are ideal. Small: The three small Magic Erasers are great for small jobs such as cleaning toys or getting into hard to reach areas such as kitchen or bath fixtures. Medium: The two medium Magic Erasers are ideal for jobs such as cleaning surfaces, inside the refrigerator or ice cooler or for cleaning a sink. Large: The large Magic Erasers work great for large areas such as plastic patio deck chairs or tables. A package of the Select-A-Size Erasers is priced at $3.50. I am happy with the results from this innovative product. I like the convenience of being able to choose a Magic Eraser size for the task that I have on hand. I used the smaller Magic Erasers to get into areas that are hard to reach such as in between my bathroom sink fixtures. After cleaning, everything shined and looked great. The package comes with several Magic Erasers making it easy to find the right size for whatever you plan on cleaning. The erasers pull apart easily, and you can use them for several jobs. When choosing a size of the Magic Eraser, go for the smallest size first. You will be surprised at how much you can clean with a little amount of the Magic Eraser. I think the smaller sizes fit perfectly into your hand, making them ideal for a range of surfaces. You may want to store several of each size eraser in different areas of your house so if you see any stains or grime, you are prepared for any task. Keep in mind that Magic Erasers wear out more quickly than a traditional sponge due to the abrasive rubbing that tears the foam pad. You will want to keep more than one in your cleaning stash. Also, you should not use Magic Eraser on surfaces with flat paint, or surfaces where you are not supposed to use abrasives. The Extra Power Pad has the scrubbing power of Mr. Clean Magic Eraser and can clean dirt and grime off floors more easily and more thoroughly than a traditional mop and bucket. The Power Pads feature 200 micro scrubbers and an innovative scrubbing strip that removes dirt and traps and locks in debris, allowing your floors to dry fast. The Swiffer WetJet mop has a dual-nozzle and a side scrubber making it easy to spray your floor and scrub with the side scrubber. The Swiffer WetJet Power Pad Starter Kit is priced at $21.99 and pad refills are priced at $6.97. Swiffer WetJet cleaning solution is priced at $4.99. I like the new Swiffer Power Pads. I used them on laminate flooring and not only do I like the fresh scent it left behind, but I was impressed with how well it removed dried on dirt and stains and left the floor with a great shine. There was no need to scrub by hand since the Power Pads removed anything left on the floor, and you do not have to tote along a separate bucket, which makes cleaning mess-free. Cleaning with the Swiffer was easy and fast, leaving me more time to do other things. I think this mopping system is a must-have for any home. I would recommend both products to family and friends and will continue to use them in my home. If you are cleaning your floors and come across an area with extra dirt or grime, spray the Swiffer cleaning solution and allow it to sit for a minute or two. With the use of the new Power Pads and a little elbow grease, your floor will be shining like new. You will want to replace the pad after each use since it will collect any dust or debris that was on your floor. Mr. Clean products can be found at mass merchandise stores such as Walmart and Target as well as at drug and grocery stores nationwide. To find out more about the line and to see tips and deals, visit mrclean.com.